Well I though if I gave body mountain.com my thoughts on there new site I’'d ask for the same for one of my new sites. Fair is fair. Comments are always welcomed. Another amazing web site. Impressed with menu - works very well. Thanks for taking the time to view and give your thoughts. It’s a different type of menu, but it seems to work well. I am impressed with the menu as well! Looking good. Only one problem with the email address on my iPad in portrait mode. Keep up the good work! how did you get the great navigation? „get to top“ red icon … how done in red? mine is always grey and not really good visible. Thank You. The navigation is simply two blocs in the top global area. The top menu and a hidden block below that is triggered by using the toggle visibility on the menu button. I created my own menu icon but you can use any icon in Blocs. The colored open/close icon in the drop down menu is controlled by created a class. The normal / hover state color of the icon is controlled in the text tab. Just change the text color background in the class. That looks really good and like everyone else I love the menu. One little point: is it definitely “fisherman’s” association, rather than “fishermen’s”? I made the change. I love this forum. So many eyes to help. My client proofed the side with several eyes so yours are the best! 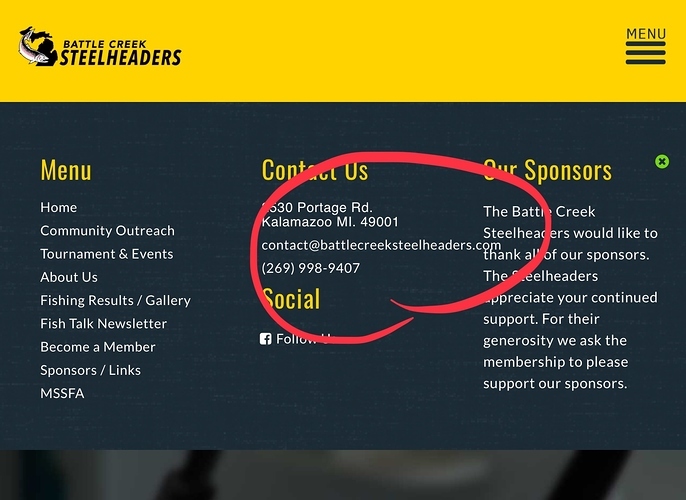 "Battle Creek Steelheaders is one of "?